VeryVintageVegas is pleased to be one of the sponsors of the “Zick and Sharp” Panel discussion and Bus Tour on OCTOBER 3rd. Zick and Sharp were the most prolific mid century modern architects of Las Vegas. We started documenting their body of work last year after discovering a CD presentation that was made to the school board by Walter’s daughters. They were trying to get a school named after him. We joined that bandwagon, but got sidetracked and never finished the research for that series. Now we’re back on it and incorporating it into the upcoming panel discussion and bus tour. Among the work that we’ve already explored and discussed has been Maude Frazier Hall (gone now); The POD SCHOOLS; and Nevada Savings. There’s plenty more that we’ll be covering and Classic Las Vegas and VeryVintageVegas hope that you can join us on October 3rd. The un–official announcement is out and the plans are in place (except for a way to RSVP and pay for the bus tour – We’ll open the registration next week. Space will be limited for the bus tour, but abundant for the panel discussion). 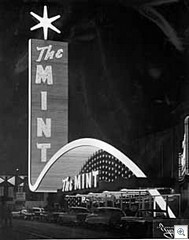 If all Walter Zick and partner Harris Sharpe ever designed was the Mint Hotel and it’s beautiful neon sign that would be enough. But Walter Zick designed much more than just the most beloved, lost neon sign of Las Vegas. He designed a variety of commercial buildings, mainly banks, schools and residential homes. A lot of his architecture is still standing which is really amazing considering the reputation Las Vegas has with preserving history. As noted here earlier this year, we became much more aware of Walter Zick’s architectural contribution to the Las Vegas Valley when we got a disc from Jack LeVine over at VeryVintageVegas that had been put together by Zick’s daughters in hopes of having a school in the Valley named after their father. While the School District turned down the daughters, we came up with an idea and working with the Nevada State Museum, Las Vegas and Nevada Humanities, we received a grant to do a program centered around Walter Zick and his mid-century architecture. On October 3rd we will have a panel discussion at the State Museum on the work of Walter Zick. Confirmed panelists include our favorite mid-century author and historian, Alan Hess, Assemblage Studios’ architect, Eric Strain, Karen Zick Goff and her sister, Claire and neon designer, Brian “Buzz” Leming. Following the discussion, there will be an afternoon bus tour of some of Zick’s still-standing architecture. The final stop on the tour will be the Morelli House. Though Zick did not design the Morelli House, it’s mid-century architecture makes it a perfect place to have a small reception before returning to the State Museum. We are currently working out the bus route, which we hope will include a few stops so that we can see the interiors of some of the buildings. Once we have all the details worked out, we will post them here. Seating for the bus tour is limited and reservations will be necessary. Once we have the reservation number working, we will post that as well. So, subscribe to this blog because you are not going to want to miss this. If you ever wondered what happened to mid-century modern Las Vegas or how it came to be, this is the program for you. If, like me, you’ve always appreciated how modern our Valley truly was, you won’t want to miss this program. It’s going to be historic, fact-filled and lots of fun. This program made possible by Nevada Humanities and the Nevada State Museum and the generous donations of VeryVintageVegas, the Friends of Classic Las Vegas, Brian “Paco” Alvarez and the Junior League of Las Vegas.